IT'S OFFICIAL » Riley Wallace annnouced he will resign as Hawaii's basketball coach at the end of this season. He has been the head coach at the school for 20 years. Take precautions to breathe easier. Protecting lives is found to outweigh Hawaiian concerns. An agreement with the state will keep the facility open at least through February. Colt Brennan could pass on UH and throw in the NFL. The Shingon Mission expects to hand out some 3,000 good-luck amulets to members and visitors. 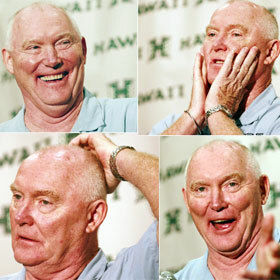 The UH basketball coach will honor a contract that calls for him to step down after the season. The retailer plans to proceed with a $40 million renovation of its Waikiki Galleria. A legal dispute has arisen in the county's hunt for a new police chief. The despot who claimed he was destined by God to rule Iraq has been put to death.